The reason why Facebook paid a billion dollars for Instagram is the same reason why Pinterest is one of the fastest growing social media sites in history. Over 300 million photos are uploaded to Facebook every single day! Facebook users love liking, commenting on, and sharing photos more than any other type of content on Facebook. So posting photos automatically gives you an advantage in the Edgerank game. Make sure your photos are at least 851 x 403 pixels to accommodate highlighting or possible use as Cover images. That said, you should also consider posting sizes even larger so that when users view photos in fullscreen, they’ll see the image at the highest resolution. This varies depending on screen size, but as an example, a 17-inch Macbook Pro is 1920×1200 (iPhone photos are 1936 x 2592). 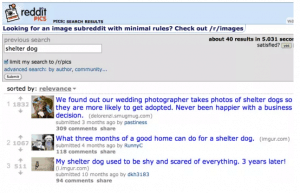 Reddit, like Craigslist, is probably one of the ugliest but most useful websites on the internet. You can easily search for photos related to your cause and sort them by recency or popularity. And if it’s received a lot of attention on Reddit, chances are it will do well with your Facebook Page. One common factor that helps content go viral is the ability for users to make it their own. 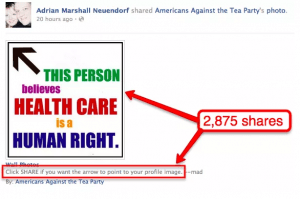 Americans Against The Tea Party created an image (shown above) that allowed users to point an arrow at their profile pic once they shared the photo (make sure you mention your organization in small print at the bottom of the image). You can see how that works by sharing on of these more politically neutral images. Find a curious photo and ask your fans to come up with a caption for the photo. You don’t necessarily have to reward the best one, people like playing games like this just to play the game. You’ve been busy focusing on your Facebook Page over the past month (which is understandable given the switch to timelines). But don’t forget that your fans are looking for ways to make their profiles look great too! 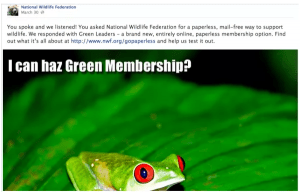 One way to help them, and promote your cause in the process, is to create cover images. Check out the batch Best Friends Animal Society created to promote their Spring Pet Super Adoption campaign. Because photos have a huge Edgerank advantage over other types of content, why not post photos as links on your Facebook Page. Select an awesome photo within a recent blog post (hopefully you have a blog). In the “Say something about this” field, post a short description about the article along with a link (as shown above). Users will be more likely to share, comment on and like an amazing photo than they would a link to an article containing that same amazing photo. A better means to the same end. When you post photos to Pinterest, you have an option of including a URL users can click on in the image. Try re-posting a few photos from your Facebook Page onto Pinterest and link back to the photo on Facebook. Eventually, you can use Insights to find out how much traffic Pinterest is sending to your Facebook Page. How to find your people on the social web – fast!